Yesterday (7/1/2017), I watched as the story broke about the death of Bianca Roberson, in what is being called a case of “road rage”, today, David Desper is charged with murder. So many times over the years, I too, have participated in what could only be defined as “road rage.” One time, a convertible sports car aggressively cut me off as I was driving into New York City on the 59th street bridge, initially ignoring him, then, as I was coming off the bridge, I noticed the guy in convertible, I had the opportunity to repay the favor, which I did, cutting him off aggressively. This infuriated the man and he started driving beside me erratically. Finally, near Central Park, he began banging on my closed window, demanding to talk. Ignoring him didn’t work, I finally held of my “bag” phone (this was a while ago) and asked if I should call the police to help resolve, he then went speeding off. As I think about Bianca, this could have been me, the victim, however, I could have also caused the guy in the convertible to be killed by my behavior, quickly making me the victimizer. With Ms. Roberson and whomever killed her; Ms. Roberson’s life ended prematurely, her family and friends broken and for the person that pulled the trigger, a life upended, also a family and friends broken. This blog post isn’t about passing judgement on either party but rather a reminder to myself not to let the little things bother me which I so often do. I am reminded of Mark 12:28-31 (NIV) where Jesus explains what the greatest commandment in the bible is, followed by the second. It’s my hope and prayer that the next time I believe I’m being treated unfairly or misunderstood that I remember these verses and love God first and love others as myself, paving the way to increase God, decreasing myself, staying in the present, creating the opportunity to have a positive impact on others instead of a negative one. Listened to this series of talks by Andy Stanley on a run last week. Great listening. Yesterday, I was challenge when a friend explained how he talks with people in the deli line that he doesn’t know, sometimes sharing about the pain in his life. The chat reminded me of a podcast “Don’t Waste Your Pain” by Rick Warren. The chat with my friend and a reread of this post is a good reminder to me to not waste my pain. Your greatest ministry will flow out of your pain — not out of your strengths or your talents but out of the painful experiences of your life. It is your weaknesses that help other people in their need, not your strengths. A great example of this is the apostle Paul. In 2 Corinthians 1, Paul says that he was in a time of his life when he was so discouraged that he was ready to kick the bucket. He despaired of life itself. He was ready to give up on life. He was ready to crawl in a corner and die. And Paul was probably the greatest Christian who ever lived except for Jesus! But Paul was able to say this in 2 Corinthians 1:2-5: “I pray that God our Father and the Lord Jesus Christ will be kind to you and will bless you with peace! Praise God, the Father of our Lord Jesus Christ! The Father is a merciful God, who always gives us comfort. He comforts us when we are in trouble, so that we can share that same comfort with others in trouble. We share in the terrible sufferings of Christ, but also in the wonderful comfort he gives” (CEV). Who can be more sympathetic than somebody who has already been through what another person is going through right now? Who can better help the parent of a special needs child than a parent who raised a special needs child? Who can better help somebody going through a bankruptcy than somebody who has gone through it before? Who can better help somebody experiencing the heartbreak of divorce than somebody who remembers how terrible it felt? Who can better help somebody who’s been abused or molested than somebody who has been abused or molested? What is the painful experience in your life that you want God to use for good in someone else’s life? Who do you need to forgive so that you can move on from your pain and release it for God to use in ministry? Who do you think you can share your experience with so that they can receive God’s comfort? Sometime in the early 90’s, I began attending Redeemer Presbyterian Church. I believe I went the first time when a friend from my home town was visiting New York City. In ’94, I was married, my wife was later baptized at Redeemer. Only recently, I finally discarded the boxes of cassette tapes with my favorite Tim Keller sermons (thankfully most of them are now online, many free). While I now attend church on Long Island, my family does manage to visit Redeemer a few times each year. In between visits, I truly value reading Tim Keller’s tweets. Each a little nugget that weaves nicely into where I’m at on my journey as a Christ Follower in progress. I retweet the ones I want to be able to refer back to at a later date. The last 10 retweets from my Twitter account @IAMFollowerTodd follow. Religion says earn your life. Secular society says create your life. Jesus exchanged his life for ours. You are more sinful than you could ever dare imagine and you are more loved and accepted than you could ever dare hope-at the same time. If at the very least faith is what you trust in, then everyone has faith in something. The gospel frees us from the relentless pressure of having to prove ourselves and secure our identity through work. Do you realize that it is only in the gospel of Jesus Christ that you get the verdict before the performance? Money, itself, isn’t usually an idol. What you put your money towards does show you where your idols are. If you want God’s grace, all you need is need, all you need is nothing. Everyone tends to substitute something for God’s grace. There are some needs only you can see, some hands only you can hold and some people only you can reach. In September 2013, a man in Hong Kong explained to me that his companies research (link below) showed that engaging with the bible at least 4 times per week could change peoples lives. They built a free mobile app called GoTandem to help facilitate their findings. I downloaded the app the evening after we met and have been using it ever since. When you start, the app has a brief survey that then enables bible verses to be custom tailored. I’ve retaken taken the survey a couple times to adjust the bible verses to my circumstances. Below are my favorite bible verses from March 2017. My March 2017 favorite bible verses. The posts on this blog are mostly articles, books, videos, bible verses, sermons, reflections from a conversation, etc. that someone was kind enough to suggest I read, listen to or view. This is one of those such articles. In this case, a friends wife thought we both might find this article from Jon Bloom helpful. She was so right, terrific article. I’m very grateful for friends like this, I need all the help and direction I can get. This principle seems to hold true in nearly every area of life: The most satisfying joys we experience are realized mainly through adversity and struggle, while poor, unhealthy, thin joys can be had without much effort. Fulfilling joys usually require strenuous pursuit. Another similar principle also seems to be true: When the pursuit of a fulfilling joy moves from an inspiring idea to actually having to work hard for it, the reward suddenly diminishes in appeal. Therefore, we must often strenuously pursue a fulfilling joy when we don’t feel like it. I find both principles are often true when it comes to thanking God. A heart full of thanksgiving experiences profound joy. But cultivating a thankful heart is hard work — work we often don’t feel like doing. But God knows this about us, and his many commands that we “magnify him with thanksgiving” (Psalm 69:30), “come into his presence with thanksgiving” (Psalm 95:2), “sing to [him] with thanksgiving” (Psalm 147:7), pray “with thanksgiving” (Philippians 4:6), eat “with thanksgiving” (1 Timothy 4:3), indeed, “give thanks in all circumstances” (1 Thessalonians 5:18) are not intended as guilt-ridden reminders of how ungrateful we are. Rather, these commands are prescriptions written by the Good Physician to help us escape from chronic bouts of discouragement. Discouragement is, by definition, a deficit of courage. Biblical courage is the ability to face uncertainty, adversity, danger, or suffering with faith-fueled hope that God will keep his word to us, come what may. Paul went so far as to say that since “all the promises of God find their Yes in [Christ],” especially the resurrection, we should “always [be] of good courage” (2 Corinthians 1:20; 5:6). But we are not always of good courage. Why? Because unbelief in the promises of God dis-courages us. This is the focus of all Satan’s massive, multifarious strategies: to dis-courage us through dis-belief in God’s promises. His strategies are disorientingly sophisticated, but his goal is simple: to discourage Christians. Discouraged Christians are immobilized threats. They are diffused gospel bombs. They are silenced evangelists whose faith-anemia can be contagious. Is it really any surprise that we find discouragement a chronic problem? Daily placed before our eyes, spoken into our ears, and breaking our hearts are reasons to be discouraged — and our indwelling sin is quick to believe them. That is precisely why right after Paul says, “we are always of good courage” (2 Corinthians 5:6), he says, “for we walk by faith, not by sight” (2 Corinthians 5:7). Worldly perceptions will tend to sap our courage. But faith perceives a reality so hopeful that even death itself cannot quench the resulting courage. What does this have to do with thanksgiving? Nothing is as en-couraging as seeing God’s abounding grace (2 Corinthians 9:8), and gratitude is what we feel when we see it (2 Corinthians 1:11). But what we need to understand is that biblical thanksgiving is not merely our grateful response to a perceived grace received from God; it is a means to perceiving that grace. Biblical thanksgiving is not merely a command to be obeyed; it is a call to see beyond our normal perceptions to hundreds of graces we would otherwise miss due to our sin-induced myopia. And it is a call to see future graces in God’s promises so certain that we can thank God for them now. That’s why God commands us so often in the Bible to give thanks. The commands prompt us to ask, “What do I have to be grateful for?” That question alone can stop the train of our thoughts from derailing into discouragement, while it draws us back on the track of faith. It forces us to answer, and in answering, we start seeing graces. So, the obedient act of giving God thanks actually results in our feeling grateful to God. The commands are in and of themselves gracious. God intends for this practice of thanksgiving to become a gracious habit. The more habitual thanksgiving becomes, the more gratitude we will feel. We will find that to “give thanks in all circumstances” (1 Thessalonians 5:18) is not an impossible ideal, but an increasingly satisfying joy, and a potent, counterintuitive antidote to discouragement. Thanksgiving is a counterintuitive antidote to discouragement because when we feel discouraged, we don’t feel like giving thanks. That’s why we must remember those two common principles: 1) fulfilling joys usually require strenuous pursuit, and therefore, 2) we often don’t feel like pursuing the things we need most. This experience is “common to man” (1 Corinthians 10:13). When we experience it, we shouldn’t be surprised as if something strange were happening to us (1 Peter 4:12). Experiencing the joy of gratitude requires the hard work of learning the habit of thanksgiving through daily practice. It’s difficult to learn because of our deeply ingrained habits of seeing the world through self-centered lenses. And because Satan works hard to distract us with all sorts of discouraging things. But there is abounding grace available to help us see grace (2 Corinthians 9:8). That’s why there is an abundance of commands for us to give thanks! These commands are a grace, for they call forth in us what they demand of us. Mine the Bible for the “thanks” and “thanksgiving” commands, and practice them — especially when you don’t feel like it. That’s likely when you need them the most. And “give thanks in all circumstances” (1 Thessalonians 5:18). Fight discouragement with thanksgiving. Fight hard! God will supply the strength you need (1 Peter 4:11; Philippians 4:19). As you obey, you will begin to see and savor the grace you missed before. In December, a friend gave me a copy of Walking with God by John Eldredge. Another person I met raved about Wild at Heart from John Eldredge and last week someone I respect started reading daily the “Daily Prayer (Extended Version) from John Eldredge and Ransomed Heart. The prayer is below as well a link for the pdf and MP3. “My dear Lord Jesus, I come to you now to be restored in you, renewed in you, to receive from you all the grace and mercy I so desperately need this day. I honor you as my Sovereign, and I surrender every aspect and dimension of my life totally and completely to you. I give to you my spirit, soul, and body, my heart, mind, and will. I cover myself with your blood—my spirit, soul, and body, my heart, mind, and will. I ask your Holy Spirit to restore me in you, renew me in you, and lead this time of prayer. In all that I now pray, I stand in absolute agreement with your Spirit and with my intercessors and allies, by your Spirit and by your Spirit alone. Dearest God, holy and victorious Trinity, you alone are worthy of all my worship, my heart’s devotion, all my praise, all my trust, and all the glory of my life. I love you, I worship you, I give myself over to you in my heart’s search for life. You alone are Life, and you have become my life. I renounce all other gods, every idol, and I give to you the place in my heart and in my life that you truly deserve. This is all about you, God, and not about me; you are the Hero of this story, and I belong to you. I ask your forgiveness for my every sin. I renounce my sins. I ask you to search me and know me and reveal to me where you are working in my life and grant to me the grace of your healing, deliverance, your holiness, and a deep and true repentance. Heavenly Father, thank you for loving me and choosing me before you made the world. You are my true Father—my creator, redeemer, sustainer, and the true end of all things, including my life. I love you, I trust you, I worship you. I give myself over to you, Father, to be one with you in everything as Jesus is one with you. Thank you for proving your love by sending Jesus; I receive him and all his life and all his work which you ordained for me. Thank you for including me in Christ, for forgiving me my sins, for granting me his righteousness, for making me complete in him. Thank you for making me alive with Christ, raising me with him, seating me with him at your right hand, establishing me in his authority, and anointing me with your love, your Spirit, and your kingdom. I receive it with thanks and give it total claim to my spirit, soul, and body, my heart, mind, and will. I bring the life and work of the Lord Jesus Christ over my life today, over my home, my family, my household, throughout my kingdom and domain. Jesus, thank you for coming to ransom me with your own life. I love you, I worship you, I give myself over to you to be one with you in all things—spirit, soul, and body, heart, mind, and will. I sincerely receive all the work and triumph in your cross, death, blood, and sacrifice, through which my every sin is atoned for, I am ransomed and delivered from the kingdom of darkness and transferred to your kingdom, my sin nature is removed, my heart is circumcised unto God, and every claim being made against me is disarmed this day. I now take my place in your cross and death, dying with you to sin, to my flesh, to this world, to the evil one and his kingdom. I take up the cross and crucify my flesh with all its pride, arrogance, unbelief, and idolatry [and anything else you are currently struggling with]. I put off the old man. Apply to me all the work in your cross, death, blood, and sacrifice. I receive it with thanks and give it total claim to my spirit, soul, and body, my heart, mind, and will. I bring the blood and sacrifice of the Lord Jesus Christ over my life today, over my home, my family, my household, my vehicles, finances, over all my kingdom and domain. I bring the cross, death, blood, and sacrifice of Jesus Christ against Satan, against his kingdom, against every foul and unclean spirit, every foul power and black art, against every witch, and against every human being and their spirit, their warfare and household. I bring the cross, death, blood, and sacrifice of the Lord Jesus Christ to the borders of my kingdom and domain, and I stake it there in the name of Jesus Christ. Jesus, I also sincerely receive you as my Life, and I receive all the work and triumph in your resurrection, through which you have conquered sin, death, judgment, and the evil one. Death has no power over you, nor does any foul thing. And I have been raised with you to a new life, to live your life—dead to sin and alive to God. I take my place now in your resurrection and in your life, and I give my life to you to live your life. I am saved by your life. I reign in life through your life. I receive your hope, love, faith, joy, your goodness, trueness, wisdom, power, and strength. Apply to me all the work and triumph in your resurrection; I receive it with thanks and I give it total claim to my spirit, soul, and body, my heart, mind, and will. I bring the resurrection of the Lord Jesus Christ over my life today, over my home, my family, my household, my vehicles, finances, over all my kingdom and domain. I bring the resurrection and the empty tomb of Jesus Christ against Satan, against his kingdom, against every foul and unclean spirit, every foul power and black art, against every witch, and against every human being and their spirit, their warfare, and household. I bring the resurrection and the empty tomb of the Lord Jesus Christ to the borders of my kingdom and domain, and I stake it there in Jesus’ name. Jesus, I also sincerely receive you as my authority, rule, and dominion, my everlasting victory against Satan and his kingdom, and my ability to bring your Kingdom at all times and in every way. I receive all the work and triumph in your ascension, through which Satan has been judged and cast down, and all authority in heaven and on earth has been given to you. All authority in the heavens and on this earth has been given to you, Jesus, and you are worthy to receive all glory and honor, power and dominion, now and forever. I take my place now in your authority and in your throne, through which I have been raised with you to the right hand of the Father and established in your authority. I give myself to you, to reign with you always. Apply to me all the work and triumph in your authority and your throne; I receive it with thanks, and I give it total claim to my spirit, soul, and body, my heart, mind, and will. I now bring the authority, rule, and dominion of the Lord Jesus Christ over my life today, over my home, my family, my household, my vehicles, finances, over all my kingdom and domain. I now bring the authority, rule, and dominion of the Lord Jesus Christ and the fullness of the work of Christ against Satan, against his kingdom, against every foul and unclean spirit—every ruler, power, authority, and spiritual force of wickedness, their every weapon, claim, and device. [At this point, I specifically name all foul and unclean spirits that I know have been attacking me, such as fear, doubt, accident, injury, death, the religious spirit, pride, arrogance, etc.] I send all foul and unclean spirits bound to the throne of Christ, together with every back-up and replacement, every weapon, claim, and device—by the authority of the Lord Jesus Christ and in his name. I command the judgment of the Lord Jesus Christ upon the heads of those that refuse to obey, and I send them to judgment, by the authority of the Lord Jesus Christ and in his name. I now bring the authority, rule, and dominion of the Lord Jesus Christ and the fullness of the work of Christ against every foul power and black art—every hex, vex, and incantation, every spell, weave, web, veil, shroud, charm, and snare; against every ritual, sacrifice, and device; against every vow, dedication, and sacrifice, every word, judgment, and curse—written, spoken, unspoken, or transferred to me. I command them disarmed and broken by the authority of the Lord Jesus Christ and in his name. I now bring the authority, rule, and dominion of the Lord Jesus Christ and the fullness of the work of Christ against every witch, cult, and coven, every channel of black arts to me. I cut them off in the name of the Lord; I send the glory of God to them to turn them in Jesus’ name. I now bring the authority, rule, and dominion of the Lord Jesus Christ and the fullness of the work of Christ between me and every human being—their spirit, soul, body, their sin, warfare, and their household. I bring the full work of Christ between me [and now I name people that I’ve counseled or prayed for, family members, folks in crisis looking to me, etc.] I command their human spirits bound back to their bodies and their warfare bound to the throne of Christ in their life. I bring the full work of Christ between me and my household and all people, in the authority of Jesus Christ and in his name. Holy Spirit, thank you for coming. I love you, I worship you, I trust you. I honor you as Lord. I receive all the work and triumph in Pentecost, through which you have come, you have clothed me with power from on high, sealed me in Christ, become my union with the Father and the Son, the Spirit of truth in me, the life of God in me, my counselor, comforter, strength, and guide. I honor you as Lord, and I fully give to you every aspect and dimension of my spirit, soul, and body, my heart, mind, and will—to be filled with you, to walk in step with you in all things. Fill me afresh, Holy Spirit. Restore my union with the Father and the Son. Lead me into all truth, anoint me for all of my life and walk and calling, and lead me deeper into Jesus today. I receive you with thanks, and I give you total claim to my life. Heavenly Father, thank you for granting to me every spiritual blessing in Christ Jesus. I claim the riches in Christ Jesus over my life today, over my home, my family, my work, over all of my kingdom and domain. I bring the blood of Christ once more over my spirit, soul, and body, over my heart, mind, and will. I put on the full armor of God: the belt of truth, breastplate of righteousness, shoes of the gospel, helmet of salvation; I take up the shield of faith and sword of the Spirit, and I choose to be strong in the Lord and in the strength of your might, to pray at all times in the Spirit. 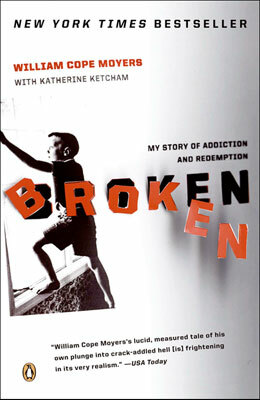 Wow is all I can say, I am grateful I listened to “Broken, My Story of Addiction and Redemption” by William Cope Moyers. I originally read the cover and thought to myself, this book sounds to heavy, but finally, on a drive to an appointment several hours from home, I began to listen and listen. As Williams’story unfolded, I found myself with a very heavy heart. I kept listening and listening, I found myself thinking, “Ok William” I’m ready for the redemption part, the good news, but it kept not coming. I finally did make it to where William came to the realization that he could not do it on his own, it was October 8, 1994. William is working on his recovery to this day. I found a video posted on youtube from 2010 where he addressed an audience about addictions at the Library of Congress. He talked about how the world doesn’t recognize addiction like other illnesses and an organization named Faces and Voices of Recovery is one of many getting the word out. I am thankful I listened to the book as I didn’t realize the harm it does to the support of future addicts when those that recover stay quiet about their recovering. Williams makes a strong case that addictions should be treated just like cancer and other illnesses. I will stop now as I’m not giving this book justice, hope you read or listen to it. Broken tells the story of what happened between then and now-from growing up the privileged son of Bill Moyers to his descent into alcoholism and drug addiction, his numerous stabs at getting clean, his many relapses, and how he managed to survive. Harrowing and wrenching, Broken paints a picture of a man with every advantage who nonetheless found himself spiraling into a dark and life-threatening abyss. But unlike other memoirs of its kind, Broken emerges into the clear light of Moyers’ recovery as he dedicates his life to changing the politics of addiction. Beautifully written with a deep underlying spirituality, this is a missive of hope for the scores of Americans struggling with addiction-and an honest and inspiring account that proves the spiritual insight that we are strongest at the broken places. Several people mentioned the Serenity Prayer to me so posting. Details on Serenity Prayer from Wikipedia. Listened to Rick Warren’s devotional this morning. Another great devotional. Offer love to others (everyone) the same way God loves us.